Back again and ready for more! 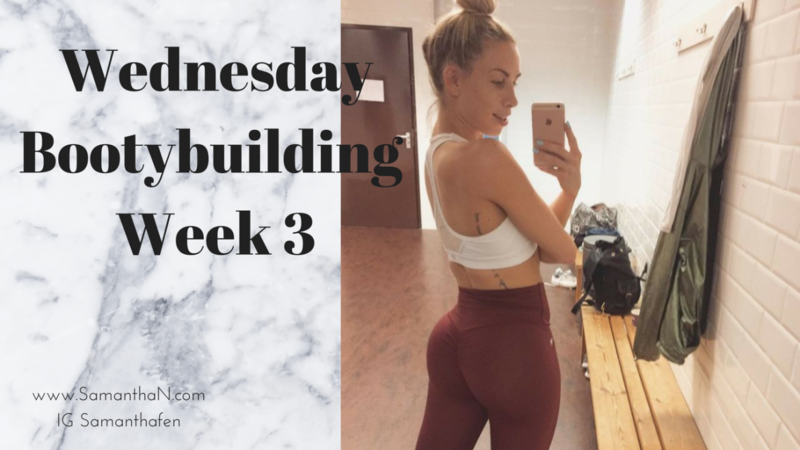 It’s week 3 of Wednesday Bootybuilding and I gotta say, for such a low impact workout I am still feeling by buns burn after this workout. For my dedicated followers, most of you know I love to work with bands, and a lot of my workouts include them. So for this week I decided to put together a workout that requires nothing more than just you and your resistance band! I’m travelling a lot for work and getting a solid workout in a gym isn’t always possible, but with this workout I can do it in my hotel room or even in the aiport if I am feeling brave haha. Same goes for before a dance performance or rehearsal, I don’t haul around weight plates and kettle balls to get my pump on, but I do have my handy dandy resistance bands with me where ever I go. The benefit of using the resistance band is it’s super light, easy to travel with, multi functional uses, and creates a great tension and resistance to your movements, giving you the pump you need and the gains you want. Frog Hip Thrusts… started off with this one because of how great it is for isolating the glutes. Loop the band around something stationary like a pole, the leg of a chair/bed or a bench. Start by stepping into the loop you created and position the band across the front of your hips. There should be tension on the band in the upright position and as you sit back. Toes are just touching allowing for a slight open rotation at the hips. Hinge at the hips as you sit back, and activate that squeeze from the bottom of the movement to the upright position. Repeat this exercise 15 times for 3 sets. If you want put a towel or mat down for your knees if they are sensitive. Next up, squats… place your band over the back of your shoulders, (not around your neck) and bend down to step onto the band. Hold the band in place with your hands and extend into your starting postion. The tension will be at its greatest in the upright position, so work that squeeze and press those heels into the ground as you straighten. Repeat this 15 times for 3 sets. Fast and easy transitions, going straight into single leg raises…. Positioning stays the same just center your standing leg to the middle of the band. As you lean forward, the back leg raises, allowing a slight bend in the standing leg which will also help with your balance. Don’t twist in your hips as you go forward, the band actually helps with this alignment because if you twist most likely you’re going to lose your balance and get pulled off your standing leg. Repeat 15 reps on each leg for 3 sets. Side steps with resistance band… this may look easy but the burn is for real! Place both feet on the band, cross the top once and hold the tension by pulling up and out on the band. Now simple, side to side steps with a slight bend in the knees, and maintain the tension on the band by not stepping in fully. Repeat 20 times, step right step L counting as 1 rep. Single leg lunges… Start with the band over the back of your shoulders again, and place your standing leg foot over the band with your back leg on a bench, chair or couch depending on where you are. Bend your standing leg and go as deep as you can with out sending your knee over your toes and without twisting in the pelvis. Push into the ground with your heel as you straighten and squeeze that standing leg glute. Repeat this 15 times each leg for 3 sets. Final burn out… place the band on the ground, and step onto one length of it. This is like a deadlift but not going into the full extension. I love this one because by minimizing the range it burns out the glutes a lot faster. Start the movement by going into a deep squat and holding onto the band between your feet. It is the start of a deadlift so your back will be engaged as well but we are telling our mind to focus on the glutes as the initiator. Every pull up is activated by the squeezing of the glutes, and don’t lose the tension as you go back down. Challenge yourself to do as many of these pulses as you can in 30 seconds for 3 sets. For the full video with all exercises click here.